If left alone by government, do the price mechanisms of market economies adjust quickly to maintain steady growth in living standards, full employment, and stable prices? More simply, if left alone, do markets quickly self-adjust? The “Yes—Markets Self-Adjust” camp believes that our market economy generally performs well and that government will only make it worse. They argue government should keep its hands off the economy: the hands-off camp. The “No—Markets Fail Often” camp has less faith in the market economy’s ability to perform consistently well and believes that government must get involved to improve the market’s performance. They argue for a hands-on role for government: the hands-on camp. Not only do economists disagree over the answer to this question, so do the politicians our students will be voting for, for the rest of their lives. 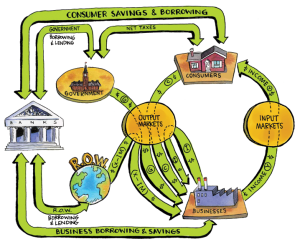 I believe the essential macroeconomic concepts students must know in order to answer that question for themselves — the macroeconomics they need to know as citizens — are included in Macroeconomics for Life: Smart Choices for All? 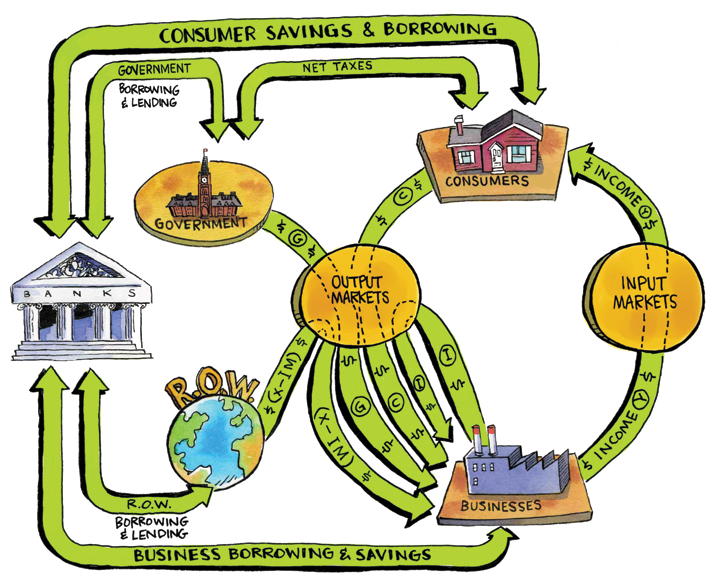 We also look at the five macroeconomic players — consumers, businesses, government, Bank of Canada and the banking system, and the rest of the world (R.O.W.) — whose combined choices create the macroeconomic outcomes we see around us. To think like a macroeconomist, to understand how the economy as a whole works, and how well it performs, the key is to focus on the connections between input markets and output markets. The role of banks and money, and the effect of expectations on decisions, are also key.